Home Science Is someone fixing NASA’s Curiosity rover on Mars? There has been a lingering question about existence of life on Mars and NASA has even sent rovers to find out. In the latest set of pictures of Curiosity rover released by NASA, it seems that the question ‘may’ have been answered. The photos of Curiosity rover appear to show a human-like figure working on the Mars Curiosity Rover feeding conspiracy theorists with new ‘evidence’ that life does exist beyond our blue planet. 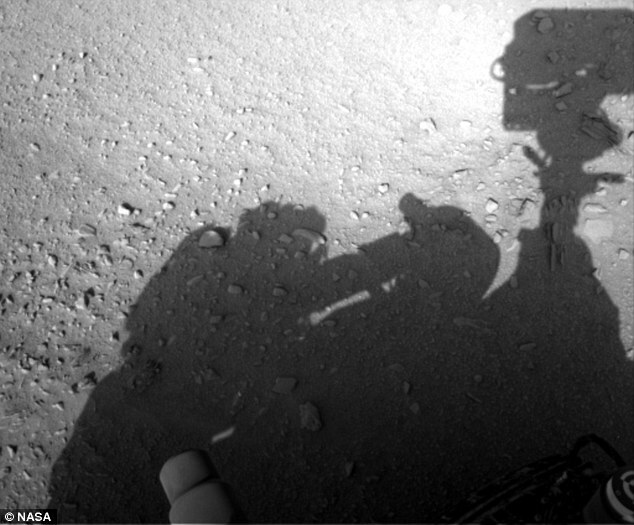 The pictures seem to show a human-shaped shadow looming over the probe as if a human or an alien is repairing it. The shadow seems to that of a man with short spiky hair and isn’t wearing a helmet. Further, from the shadow it seems that the figure is wearing sort of an air tank on his back with suit covering most of his body. The pictures were first posted by website UFO sightings daily and comes after Gary McKinnon, a computer hacker, reportedly obtained classified documents from the US government with proof that there were ‘extra-terrestrial officers’ working for the government. The latest pictures have given new fodder to conspiracy theorists to feed on, but there are those who long believe that the Curiosity Rover isn’t even be on Mars, but is on Earth at a spot that is owned by the government and out of reach of general public. People who aren’t in either of the camps believe that conspiracy theorists are seeing the alleged figure only because they want to confirm their expectations and hopes.